So I know that Stranger Danger is real and the world wide web can be a pretty scary place, but I have to go on record and say it: internet friends are just really great. Having a blog is a weird thing. You put things out there in a pretty public way, not knowing who (if anyone) is actually reading your junk (besides your Dad… hi, Dad! ), and it can feel so daunting when you consider that there are approximately one bajillion other food blogs out there, but it’s all in the way you look at it, isn’t it? 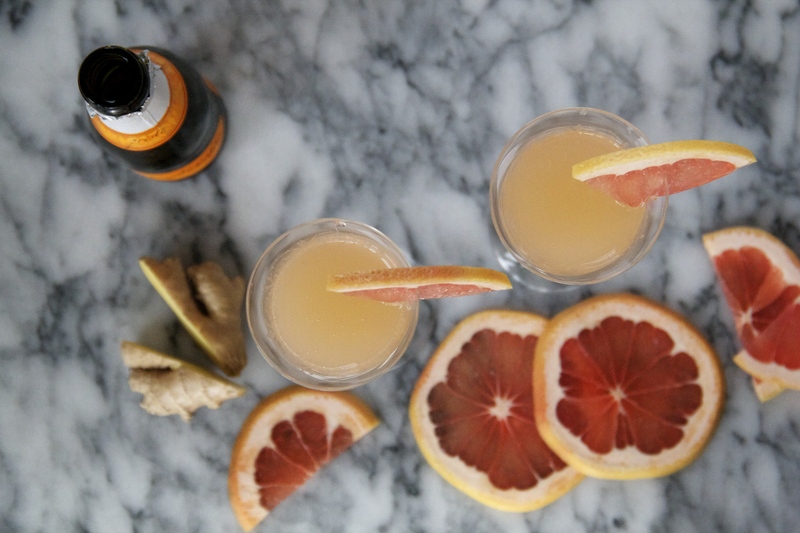 Because on the one hand there are a bajillion other bloggers out there making grapefruit cocktails and what makes YOU so special, anyway? But on the other hand, there are a bajillion other bloggers out there doing what you do, and liking what you like, and writing and cooking and CREATING, and how great a community is that to be a part of? It’s taken me awhile to find my voice and place in the whole bloggy world (and I’m not entirely convinced I’ve got anything at all figured out), but I’ve absolutely loved getting to know other bloggers throughout the process. Food blogger friends are the Bees Knees. For so many reasons, but mostly because they don’t judge you when you do bizarre things like cut little hearts in your banana bread or give cutesy and redundant names to the muffins you just baked. They make Twitter and Instagram infinitely more interesting, and they don’t even mind when you show up to a party (virtual or otherwise) with a cake that’s missing a slice because you had to photograph it (obvs). I can’t remember where I first met Emily of The Pig & Quill, but damn if I’m not glad that I did. Girl is one of the funniest and most creative blargers out there, the kind of lady who isn’t afraid to make fried hotdog sandwiches or Hawaiian street corn with SPAM or talk about the trials/tribulations of being a stroller-seeking parent blogger AND vegan chili in the same post. Plus she’s the kind of person who totes loves abbrevs, which I can def appreesh. HAPPY SURPRISE BABY SHOWER, EM! Wishing you a happy and healthy little piglet. 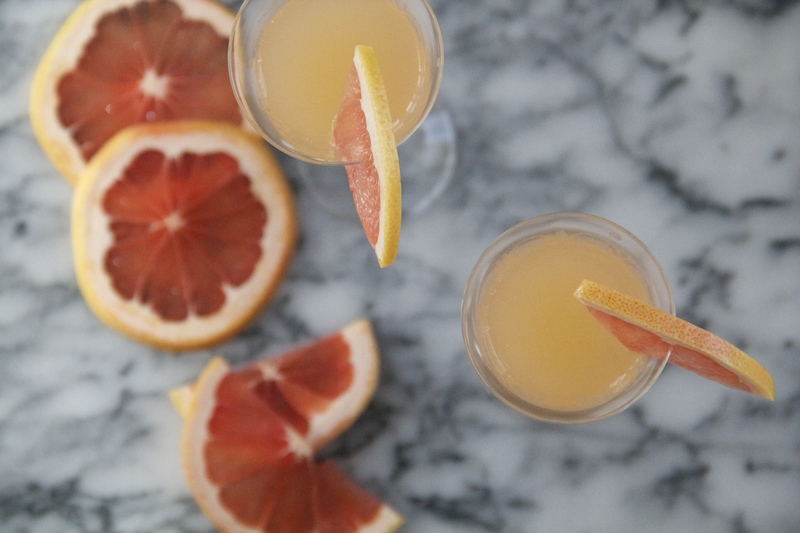 I made you pink grapefruit sparklers because they’re cute and pink and I wanted to drink one. Also they’re available in both champagne-aholic and nonalcoholic versions, so everyone wins! #champagne. Here’s to good buddies of the interwebs. Cheers! 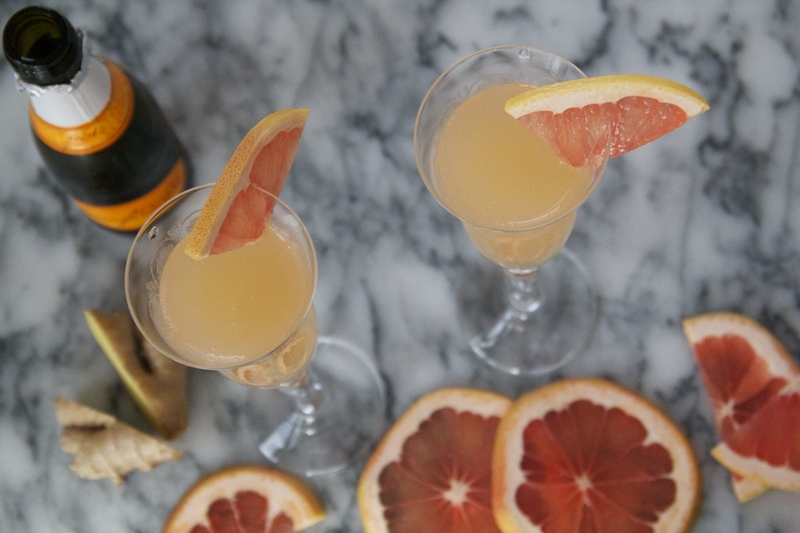 A simple ginger syrup gives these bubbly drinks a little something special. They’re a great option for Easter or Mother’s Day brunch, and can be adapted to be extra boozy or not at all. Win/win. Make the ginger simple syrup: combine the sugar, water and fresh ginger in a small saucepan over medium high heat. Bring the mixture to a boil, then turn off the heat and let the ginger syrup cool. Once cool, strain the syrup through a fine sieve. To make drinks, place a tablespoon of syrup in the bottom of a champagne glass. 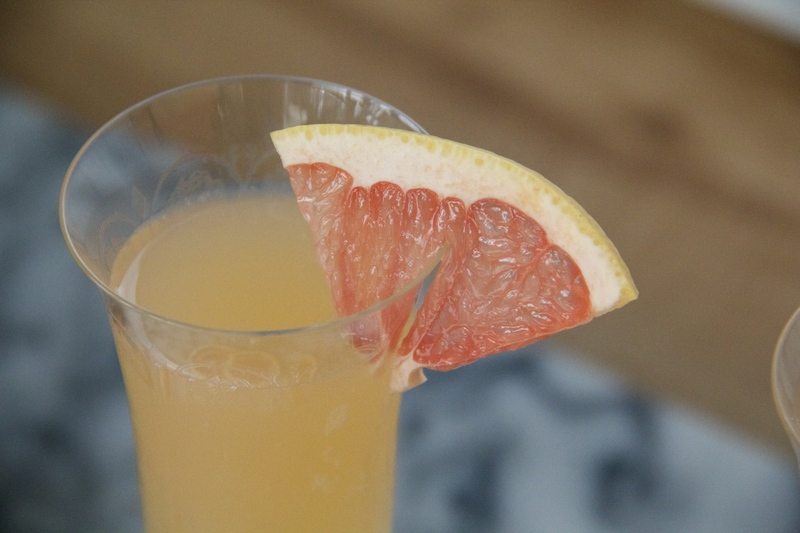 Fill the glass half full with grapefruit juice, and top it off with bubbles – either champagne or sparkling water. These are so pretty and I bet they are delicious! Em sure would have had one heck of a tasty real life baby shower. These sparklers! I love!! Thanks for celebrating Emily with us today Molly, all the love, xo! thank YOU for organizing such a fun party! Also, I’m just putting it together that you are the author of Sheet Pan Suppers — that book although I don’t own it yet, everything I’ve seen or heard about it is tops. So many congrats on that!! every baby shower needs a sparkly pink drink! cheers to emily!! Happily, I happen to have everything I need to make these…except for that great looking piece of stone in the background. I know this is not houzz, but is that granite or marble and if granite, do you happen to know what kind it is? Thx! It’s actually a marble pastry slab (from Crate & Barrel)! This is such a sweet post, Molly!! Love this and love the sound of these sparklers — so perfect for Em’s shower. I dont know that Emily, but I love the look of that cocktail! I love this post, Molly. I too feel like I’m finally figuring this whole blogging thing out and then totally haven’t figured it out at all. Also, I totally feel like shouting out, “Hey, Mom” on every post. Heheh. Love this sparklers–great way to toast Em!